This big cat has everything to impose us respect and admiration by reminding us its wild origins. Having very long legs, a slender body and a neck much longer than a domestic cat, this cat has a unique look. He has “Cheetah tears” and white spots on the back of ears as some of his feline cousins. He’s graceful and majestic in he’s approach and glance. F1, F2 and F3 Savannah cat is a very playful cat which adapts itself very well to our life. He is particularly intelligent and very sociable with children and other pets. He behaves similar as a dog. He follows his master everywhere in the house, likes bringing back balls and goes suddenly out of hiding place by making spectacular jumps in front of us. These jumps can reach 8 feet without run-up! He also likes very much playing in the water, whether it is in the bath, the shower or the toilet which he will try to empty in big blows of paw!! He is playful and very curious. He will learn very fast to open doors if something’s interesting on the other side. Moreover, with its big size, he has only to stretch to wrap the handle of the door with his front legs! We speak here about a new breed of cat. It is therefore important to understand indeed the description and the difference from a generation from another. First, the letter « F » means « foundation » and the number 1, for example, indicates the first generation of Savannahs. Our breeding program includes F1 Savannah females that all have Serval as their father and Bengal or Savannah as their mother. They hold the title F1 Savannah because they arise from a crossing between 2 different breeds: the Serval and a recognized domestic cat. TICA authorizes this first crossing with several breed either the Bengal, the savannah, the Egyptian Mau, the ocicat, Oriental shorthair and domestic shorthair. Being already unconditional Bengal lovers, we want to develop and find in our Savannah cats F1, F2 and F3 the character, the contrast, the wild look of bengals. We are working only from bengal or savannah to develop our lines. F2 Savannah kittens which we shall offer exclusively at « Shaghera Bengal and Savannah » will bring together the most beautiful lineages of Savannah and Bengal. Thanks to the exceptional quality of our F1 Savannah females and our male F5 Savannah, we shall be able of offering F2 Savannah kittens of very high quality having the wildest look in a very large size domestic cat. We make it our specialty! Our F1 Savannah females will be mated with our F5 Savannah male, and kittens from that mating will be called F2 savannah since their grandfather is a serval. 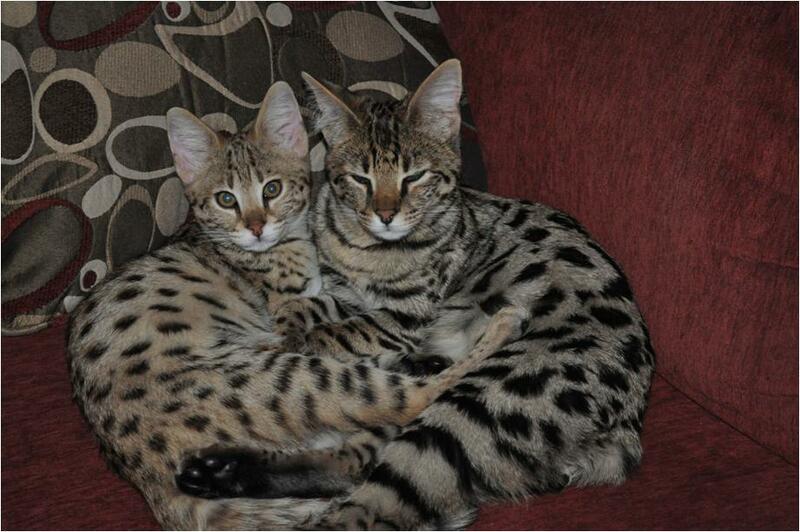 The F3 generation: result of a mating between a F2 savannah and a F5 savannah male. The F4 generation: result of a mating between a F3 savannah and a F5 savannah F5 male and so on.